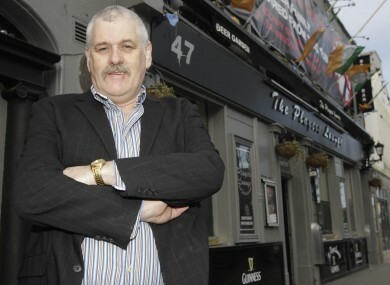 John Stokes outside his pub in Fairview near Dublin city centre last month. A DUBLIN PUBLICAN has appeared in court after being charged with demanding that another pub cease trading within 24 hours. It comes as three men connected to the same investigation appeared in court yesterday. John Stokes, 54, from the Players Lounge in Fairview, was arrested by gardaí when he presented himself at Mountjoy yesterday and was later charged with making a demand with menaces that the Castle Public House in north Dublin close within 24 hours, RTÉ reports. He was remanded on bail to appear in court next month. Stokes is the fourth man to be charged in connection with the incident. Yesterday, three men arrested on Thursday appeared in court charged with alleged menacing behaviour and making demands on a publican to cease trading in the same pub, the Irish Times reports. The men have been named as Alan Ryan, 30, Daryl Mulcahy, 20, and Derek Nolan, 29, who were charged under section 17 of the Public Order Act. The three men were granted bail and ordered to stay away from the pub in question as well as all staff members. They will appear again in court on 24 June. Email “Publican charged over pub closure threat as three others appear in court”. Feedback on “Publican charged over pub closure threat as three others appear in court”.